This hand-drawn, custom log cabin fulfills every family and mountaineer’s dream vacation. We invite you to read our review by "The Front Porch Gourmet" on line by Chef Melissa! Built above a rapid stream and overlooking a stunning ridge near Whiteside Mountain (home of the highest sheer cliffs in the Eastern U.S.), this three-level rustic home hosts four bedrooms (one king, two queens and two twins) with a loft (two twin SS), library (one twin SS) and one Queen SS in the Great Room; as well as four-baths (three claw-foot tubs with showers, master has separate tiled shower and guest has tiled stall shower). When was the last time you experienced a wall-mounted, pull-chain, toilet tank? You will at Shadow's Creek, all toilets are replicas of that by-gone era! This lodge is beautifully decorated throughout with countless vintage antiques and gorgeous bespoke furniture. Just because you’re surrounded by nature, doesn’t mean you have to rough it. Enjoy all the modern conveniences of home, including washer/dryer, dishwasher, central air conditioning/heating, ceiling fans, land-line telephones with nationwide free calling, Dish satellite TV (186 channels), Wi-Fi internet, a DVD player, and VCR with a VHS video library (yes, people still have those…we did say the house had antiques). Go beyond standard amenities with our loaded game room, complete with flat-screen smart TV, billiards, air hockey, ping-pong, Foosball, cards (poker, War or 21, anyone?) and chess/checkers! So throw some logs in either of the home’s two stack stone fireplaces and cherish time with friends and family or snuggle up to watch your favorite flick - whether it be a blast from the past, an all-time classic or the latest film you’ve been wishing to see. In the mood for watching something not on a screen? Take a walk outside on the cabin’s large covered decks. Breathe in the fresh air and take in the luscious forestry surrounding our nearly 3-acres of property. At night, gaze out at one of the starriest skies that would leave even Vincent van Gogh star-struck. With the home itself elevated up 3,800 feet, there are no city lights obstructing your view. Find every constellation and maybe even catch a falling star. For the iron chef in you, our fully-equipped gourmet kitchen meets even the most ardent culinary demands. Cook Southern favorites like grits, fried okra, pulled pork or chicken and waffles. Go a little more traditional with staples like skillet-seared steak, pizza, pancakes, eggs and bacon. If worldly cuisine is more your pace, the double-oven and Daco 6-burner gas cooktop island can take on even the most complex recipes: from paella to pierogis, from “fish n’ chips” to miso salmon, from gyros to falafel…or maybe keep it simple with wild blackberries you can pick right outside and toss into a fresh salad! Better yet, share a special moment with your kids, or become one yourself, and make some S’mores in the backyard fire-pit. To build up that appetite, get back to nature and escape the hustle and bustle of the “real world”. Venture out into the great outdoors and rough it in the woods on your own camping expedition. Though be careful, “this is bear country”! Hike upstream to a nearby waterfall or visit the numerous other falls in the surrounding area, including Whiteside Falls; the highest falls in the eastern U.S.
Thrill-seekers, dare to cliff dive into a natural pool, or take a tamer glide down a natural water slide at “Sliding Rock” (call for directions to these secret local spots). Just want to take a cue from The Eagles and "take it easy"? Play a round of golf at the Historic High Hampton Inn or rent a pontoon boat out on Lake Glenville to do some fishing or inter-tubing. If you long for a little bit of society, the quaint town of Cashiers is only 5.5 miles away! Sip a coffee at Buck’s Coffee Cafe (a personal favorite) or stock-up on supplies at the local Ingles grocery store. If you’re interested in renting this beautiful dream home or have any questions what-so-ever, please do not hesitate to contact us! Kindly note, however, in order to maintain the cabin and keep it in the best condition for you and your fellow guests, we ask you to not bring your pets (no pets allowed) and please no smoking (it is a house made completely of wood after all). Thank you for your consideration! Should you decide stay at Shadow's Creek (named after our beloved Black Labrador Retriever, "Shadow"), kindly leave a review on VRBO/HomeAway to tell us about your stay! Thank you! Our cabin was built in 2000 - from clearing the land, to watching our 765 foot deep fresh spring water well be drilled - it was a huge project. It took over two years to build! Living in Florida - lakes were not appealing to us - a rapid creek is exactly what we wanted - and got with this propety! Two Wood-burning, Stack-Stone Huge 48' opening in Great Room! Leather Sofa - Queen Size sleeper, plenty of rocking chairs! Gourmet kitchen, fully equipped. NO PAPER TOWELS PROVIDED. Three Porches. Upper level of back porch has hand-made wooden table with matching chairs. 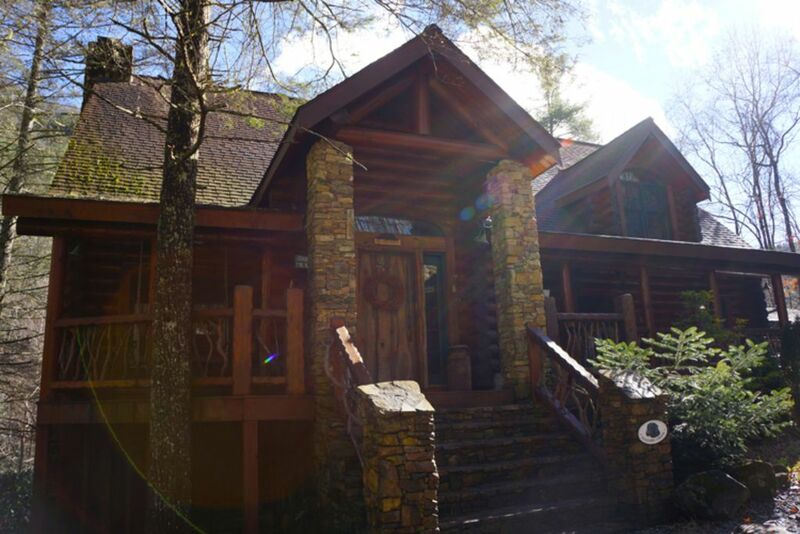 Beautiful cabin nestled in the woods in close proximity to Cashiers. Ample room for a large group. An incredible game room well furnished with all sorts of game tables. Cabin has a very nice and welcoming aroma from the logs. Home is very well built with 2 large porches above a rushing creek on the backside. Loved relaxing in the rockers on the porch. Had a issue with front door lock, but it did not deter from our enjoyment of the cabin. Wonderful secluded cabin perfect for family get-away especially for an event like the solar eclipse that we enjoyed right out front. Tumbling creek singing to us in the background at all times certainly restorative. Fabulous cooks' kitchen, huge fully equipped game room, and fun collectibles. Far off the beaten path to encourage a true vacation. Loved it! Our crew of seven enjoyed our stay with family style cooking, relaxed play (football, ping pong and pool) and comfortable bedding. A very short walk to the creek and small falls was pretty zen in such a fantastic natural backdrop. Would highly recommend and hope to stay again. My (fairly large) family stayed at this house over the weekend, and it's absolutely everything it was rumored to be! It's beautiful and secluded and just loaded to the gills with rustic charm. The house is just *enormous*, clean and well-provisioned. I certainly hope we have another opportunity to stay at this residence. We didn't have much extra time for activities around the area, but there was an Ingles just up the road, and we were able to cook breakfasts for everyone in the fabulous kitchen! Two ovens and six burners (or eight... I can't remember at this point) meant multiple people could cook to keep everyone fed. The creek is JUST out back, a minute's walk down a gorgeous, well-maintained path through the woods, and has a sweet little clearing with a large rock to sit on if you want to just relax and enjoy the sound of the little (very little) waterfall.... spoiler... I absolutely did want to do that. :) It was fantastic. place and we are so very happy they felt so too! Hope they can return soon! First of all, the owner sent us a contract that was not current. It sent us out of our way, over 30 minutes, to collect a key from an agency that had not worked with this owner for over a year. Then we opened a very old dusty sleeper couch and bugs flew out. One of the shower bathtubs was broken. The photo of the house on the listing is of the house next door. This is a log cabin and you could hear footsteps, toilet flushing etc. all over the house. The kitchen was very nice and very well equipped. We contacted HomeAway Support and they corrected the "gliche" that caused the outdated contract to be sent. We were unaware that the old contract was automatically being sent out. We take pride in the cleanliness of our cabin. Our sofa sleepers are used quite often, so it is very surprising that it would be dusty, etc. Yes this "is a Log Cabin" - therefore, the wood floors are not normal wood floors as you see in conventional homes, they are thick wooden planks and are independent of each other, not tongue & groove. We have never heard these types of complaints in all the years of renting our cabin, I can only assume an "authentic log cabin" is not something you are familiar with or desired. Equipment in a home can malfunction, i.e., a shower, a faucet, as soon as we are made aware of a problem, it is repaired. This is a $1 Million dollar log cabin, we do not allow it to fall into disrepair. The pictures of our cabin have been verified by HomeWay - you can even see the plaque at the front steps that reads "SHADOW'S CREEK" - very curious of why you would say they are that of our neighbor. They do not even have a log cabin. Unfortunately, after I received the highest electric bill in the history of our cabin, I asked my caretaker if she would have any knowledge of why. She advised that upon her arrival after your departure, all the windows were open and the air conditioning was blasting. Not very courteous, thoughtful or environmentally friendly. Our little family always enjoys our time in the Cashiers area and this was no exception. We loved the game room - it was one of the reasons we stayed there since the weather can be unpredictable (the area has a LOT of annual rainfall). We're also a "cooking" kind of family and the kitchen is well supplied. The Cashiers Sliding Rock is so close and we hiked Whiteside Mountain. There are many waterfalls to visit and Brevard is close, too. We'd recommend this for all who enjoy having a stay away home in the Smoky Mountains. June and July are a minimum of a full week rental.